Earlier this year Miami Marlins owner Jeffrey Loria made it known publicly of his intentions to sell the team that he has owned since 2002. And earlier this year it was also reported that former New York Yankees shortstop Derek Jeter was part of a group that intended to purchase the Marlins from Loria. This finally came to fruition when it was announced in August that Loria would be selling to Jeter’s group which includes former asset manager Bruce Sherman and current Charlotte Bobcats owner Michael Jordan. And now for the folks in Miami who support the Marlins could finally be able to breathe a sigh of relief due to the new regime. With the exception of the Marlins winning the World Series in 2003, Loria has mismanaged this franchise which included him suckering the City of Miami as well as Dade County into giving him the funding for a new stadium only to turn around and have himself a good old-fashioned fire sale not long after Marlins Park opened in 2012. 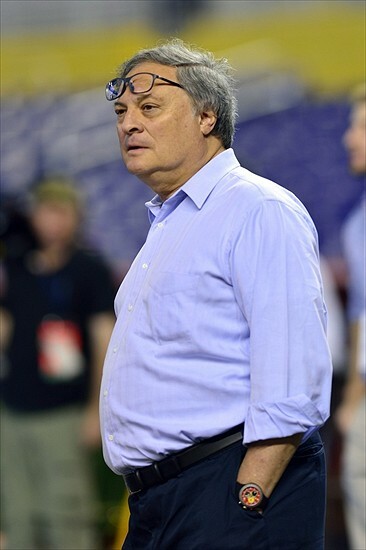 Loria is reportedly getting $1.2 billion for selling the Marlins which is a far cry from the franchise being valued at $137 million when he took over the organization in 2002. Loria is a shrewd businessman as his ability to profit from selling the Marlins has been driven up due to local television deals that the franchise has as well as Marlins Park which is a state-of-the art baseball stadium that included them hosting Major League Baseball’s All-Star Game this past July. But now that Loria is taking his money and running with it, the Marlins will actually have the chance to compete. We know about Jeter’s prowess on the baseball diamond as for 20 years he was the shortstop of the Yankees as well as being the face of that franchise. Jeter’s time with the Yankees included winning five World Series Championships, taking home the American League’s Rookie of the Year Award in 1996, and collecting 3,465 hits. With Jeter in the lineup, the Yankees never had a losing season, while they only missed the playoffs three times. And now that Major League Baseball’s team owners have approved the sale of the Marlins, you can expect some of that vintage Jeter magic to rub off on his new team. Sherman will have the title of Marlins owner, while Jeter will be the CEO and this gives him the opportunity to build the team in his own image. Jeter already has everyone within the Marlins organization on pins and needles as he appears ready to hand out pink slips in the mode of former Yankees owner George Steinbrenner. The Marlins already have building blocks in place which includes outfielder Giancarlo Stanton who led Major League Baseball in home runs this season with 59. The Marlins shocked the baseball world in 2014 when they signed Stanton to a 13-year deal for $325 million as it went against the frugal Loria’s nature. Most people expected the Marlins to trade Stanton sooner rather than later. And although that Stanton is currently the Marlins best player, would Jeter be ready to pull the trigger on a deal to ship the slugger out of town in order to free up salary as well as bring back more assets? This move by the Marlins with Jeter being on board with the franchise has the potential to have a similar impact as to what we saw when Steinbrenner purchased the Yankees in 1973. Steinbrenner was able to wake a sleeping giant and since then the Yankees have gone on to win seven World Series Championships which is by far more than any other Major League Baseball franchise over that stretch. Grant it that the Marlins don’t have the history that the Yankees have, but this ownership change will results in a much needed culture change in Miami. Since the Marlins came into existence in 1993, they have never had the combination of having a dedicated owner, a contending team, and a great ball park all at the same which now changes. You might as well get accustomed to referencing to the Marlins as the Yankees of the South, and it won’t surprise me to see the franchise once again incorporating pinstripes into their uniform which they did from 1993-2011 when they were known as the Florida Marlins. The Marlins just wrapped up their eighth consecutive losing season as this became the status quo under Loria. But with a new captain running the ship in Jeter, things will be changing on South Beach sooner rather than later.